On our way back from the New Forest, we tried to buy some venison for dinner but couldn’t find any anywhere. Each shop we tried told us that they were expecting their delivery shortly but nothing had arrived so far. In the end, we gave up and bought some from our local butcher when we got back to London. It turned out that their supplier was actually from the New Forest and it seemed silly to be buying such a local product around the corner from where we live but at least we tried. We decided we would make pie, it’s Stephen’s birthday and pie is his favourite. Since I didn’t bake him a cake, I decorated the pie instead which I think he probably preferred. Our pie dish is rather too large for two people though (which I mention each time I use it but always forget until it’s too late), hence the sinkage. It didn’t affect the taste though which was richly meaty with a background warmth from the ginger and juniper. This would have worked well as a casserole too but why you would want to eat casserole when you can have pastry I don’t know. 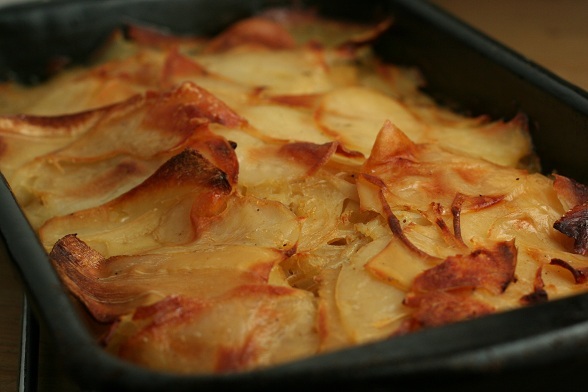 We would usually have mashed potatoes with pie but we had been talking about boulangere potatoes recently so decided to have those. It didn’t seem like an obvious pairing to me (we usually eat these with grilled fish or meat) but it worked well with the soft potato being the perfect vehicle for the redcurrant-heavy gravy. We were planning to roast some parsnips to go alongside the pie but ended up slicing those and adding them to the potatoes which worked brilliantly and resulted in less washing-up too. Start by tossing the venison in the seasoned flour and then brown in batches until the pieces have taken on a dark colour and the outsides have begun to char. Remove to a plate. In the same pan, add a little more oil if necessary and soften the onions, celery and mushrooms with some salt and pepper and the thyme for about 5-7 minutes. Add the bay leaves, ginger and coriander, stir so everything is coated and cook for another couple of minutes. Return the meat to the pan with the onions and mushrooms and add a glass of red wine. Bring to the boil and allow to bubble until the alcohol has evaporated – about a minute or so. Add the stock and the juniper berries and season. Once everything has reached boiling point, reduce the heat and simmer for about three hours. Remove the meat to a pie dish and leave to cool completely, fishing out and discarding the bay leaves and thyme stalks. Leave any excess liquid in the pan for the gravy. Top the meat with pastry, wash with egg (we didn’t have any eggs hence the slightly anaemic look to our crust) and then bake at 175 degrees for about 30 minutes. To the leftover cooking liquid add the mustard, redcurrant jelly, the red wine vinegar and the red wine. If you don’t have a huge amount of liquid then add the red beef stock too. Bring to the boil, reduce and simmer for about 15 minutes. Taste as you go and adjust to your liking, you want it to be reasonably sharp with a good kick from the mustard so that it works as a contrast to the richness of the pie filling. Thicken with cornflour if necessary. 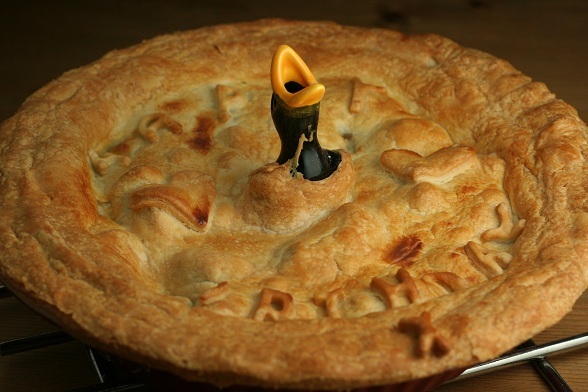 Subscribe to comments with RSS	or TrackBack to 'Venison and Red Wine Pie'. What a fantastic-looking pie. I love the birthday decoration! 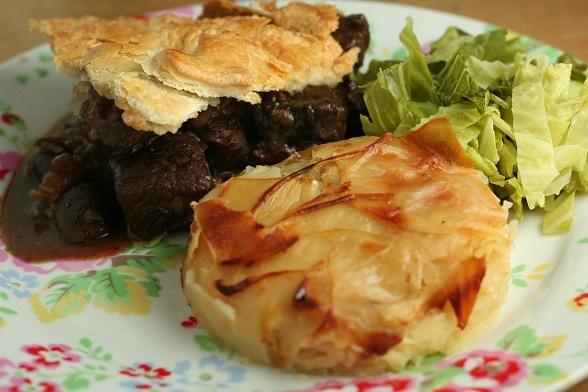 I love venison and have been making casseroles recently but my husband would be seriously chuffed if I turned it into a pie one night instead.